You may have heard about DNC Software recently, but what exactly does it do? What benefits does it have that you need? End CNC communication failures and stop manually managing your programs. One network for thousands of your CNC programs. Drip-feed, download and upload programs that are too big for the CNC memory. Make sure these crucial jobs are actually getting done at the machines on the shop floor. Hardware just won’t cut it. If you have a small shop with one or two machines, then using a Portable USB Connect may be enough for you, for now. But once your shop grows, you will get more machinery and more employees. You might already be a large company experiencing growing pains, coupled with CNC communication failures or wondering where on the shop floor your programs are floating around. Buying hardware or adding a USB port, though both actions are a great first step, won’t control your programs or get you the latest version of a file. The value is unmatched. When you invest in Predator DNC, it can be integrated with Predator MDC for machine data collection, or linked up with Predator PDM to help with paperless document control, or used with Touch HMI to make working at the machine easier. There are many integration possibilities – collecting machine trends can help improve OEE, while going paperless saves you time, and Touch HMI can replace old proprietary hardware like bar code readers. 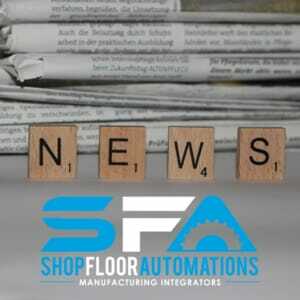 Shop Floor Automations loves being involved in the manufacturing community. We see the community is quickly growing as an influx of younger generation workers enters. This is especially true for the manufacturing community’s social media presence. SFA has been involved with the manufacturing community in a multitude of ways over the last few years. Ask us how! Call (877) 611-5825 for more info. Link to the original newsletter here.